The Lanna MICE Mart was held at the Chiang Mai International Exhibition and Convention Center from December 13 – 16, 2016 and saw buyers from ten ASEAN countries take part in learning about tourism businesses in the four provinces of the Upper North at the MICE (meetings, incentives, conventions, exhibitions) Mart. 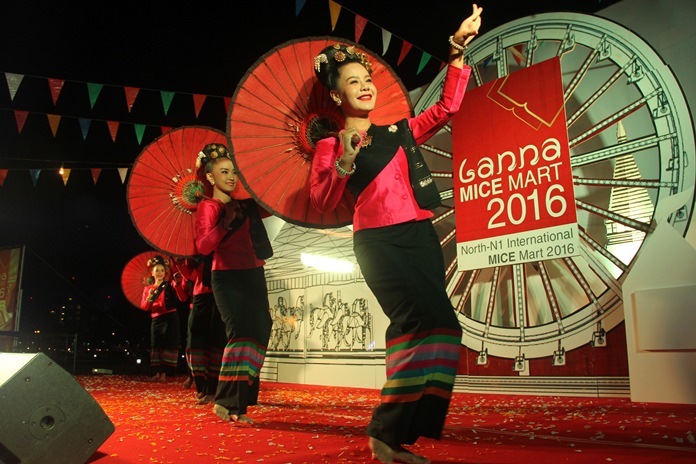 The Lanna MICE Mart was opened by traditional Lanna performances. Businesspeople from Chiang Mai, Lamphun, Lampang and Mae Hong Son took part in the event to offer booths on landmarks, arts and culture, nature and more in the Upper North. Chiang Mai Deputy Governor Prachuab Kanthiya and Suthon Wichai­rath, Director of Chiang Mai Tourism and Sports Office welcomed participants to the Lanna MICE Mart 2016, with many participants wearing national costume at th opening party. The Lanna Mice Mart 2016 was held during 13-16 December 2016 by Chiang Mai, Lamphun, Lampang, and Mae Hong Son Provinces in the Upper North Cluster Region 1 in cooperation with the Chiang Mai Tourism and Sports Office. These provinces are able to support MICE events in tourism and to create inspiration for travelers. Sixty buyers in the tourism industry in ASEAN and 60 businesspeople in the tourism industry in the Upper North Cluster 1 were invited to participate in the event. Suthon Wichairath, Director of Chiang Mai Tourism and Sports Office, said that this event aimed to promote tourism in the Upper North by inviting capable entrepreneurs and purchasers from ten ASEAN countries to join the event and use Chiang Mai as the center of the event to link to other provinces in Upper North Cluster 1. The Deputy Governor said, “Buyers will see our readiness, especially the Convention and International Exhibition Center, that Chiang Mai is ready to serve these entrepreneurs. This event also links to other attractions in four provinces in Upper North Cluster 1.” He noted that businesspeople joining this event were screened by tourism associations, chambers of commerce, and hotel business entrepreneurs for their capabilities to present MICE events, quality tourist attractions, cultures, traditions, and adventure attractions. He concluded that the event gives visiting buyers close contacts with local business people and allow them to travel around Chiang Mai and see all the Upper North has to offer in person.